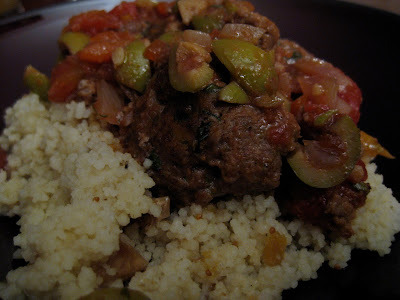 I made North African Meatballs with Fig Couscous a few months ago. We really enjoyed it, but I would say it isn't for everyone. First, you have to like green olives. Second, it has some unique flavor profiles in the both the meatballs and the sauce. The couscous was great, even though the seeds in the dried figs get stuck in your teeth. The meatballs were unbelievably tender. It was a very cheap meal (probably around $10) and ALMOST a one pot wonder. I will definitely make it again. I also love Melissa D'Arabian if you didn't already know. that looks so delish. i will make that for sure...in 3 years maybe. yay for the blog!! what kind of couscous do you use? do you use the instant couscous? whenever i've made that i've reeeally disliked it. i feel like it has a weird flavor or something. yeah, i use instant. i don't think it has any flavor at all, though. i don't like the stuff that comes in a box (especially the ones with seasoning packets). i buy the big container of plain, instant couscous. it is around $6.50. i like couscous two ways: served cold like a pasta salad with a bunch of veggies and some dressing OR served with something saucy like this. i made a pasta salad with veggies and the couscous tasted like cardboard. it was gross. oh well, maybe i'll try again with a different brand.